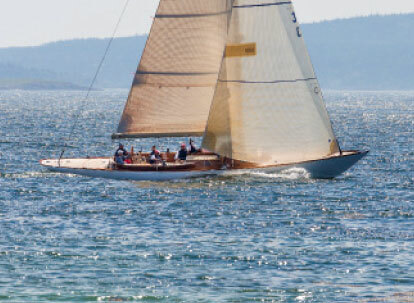 Find dockage, storage, and service for your boat in Maine. Once you’ve invested in a Maine-built boat — or even if you’re just traveling Maine waters in your transient yacht — you’ll want the right team of people to manage your vessel’s maintenance and repairs. Maine yards are well-respected for their talent, commitment and fairness with customers from around the world. When you’re ready to choose the best yard for your boat, consider what your needs are. The services available throughout Maine range from basic dockage and moorings to comprehensive refits. Perhaps you’re just seeking winter storage and decommissioning and commissioning. Most of the yards along the coast that offer storage can also accommodate a basic maintenance schedule. If you’re planning a lot of work on your vessel, consider a yard that specializes or has extensive experience that fits your needs. For example, many yards are also dealers for various engines, so you may want to shop your engine replacement to a yard with manufacturer-certified technicians. If you’re seeking aesthetic work, several Maine yards have very modern paint bays that provide exceptional finishes. There are also talented carpenters who offer interior work that rivals many of the best custom yacht companies worldwide. Consider your boat’s size when you’re choosing a yard. 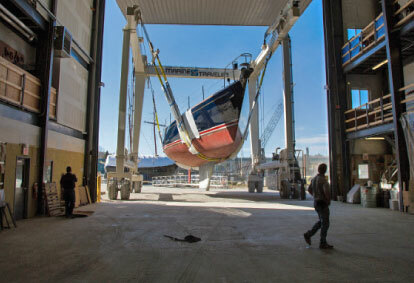 Maine yards have lifting options that include hoists, cranes and railroads. Your boat’s length, width or displacement may dictate the best option for you. Of course you should always feel free to ask for references from any yard you’re considering. Most service managers would be happy to share their success stories with you!